What we know as the coffee beans are the roasted seeds found in the small red cherry like fruit of the coffea plant. The first recordings of coffee cultivation and drinking appear in the 15th century and are linked to Sufi monasteries near Mokha in Yemen where it is described as being used in religious ceremonies and for medicinal purposes. It is now one of the most imbibed beverages in the world, being grown in 80 countries, most concentrated in the regions close to the equator. At the peak of ripeness coffee cherries are hand picked, they are sorted, flesh seperated from the seed, and then it goes through a process of fermentation to further remove mucilage around the seed. The seeds are then dried and roasted. The variety of coffee, the climate in which the growing takes place, the processing and roasting methods, as well as the specifications of grinding of the bean all contribute to the amazing array of coffee available and to the fact that coffee has developed as not just an industry, but also as a science and an art. Hawaii has and continues to play an influential role in the world of coffee. Making a name for itself with Kona grown coffee and now with up and coming Ka’u grown. Coffee is currently being grown on nearly all of the islands, both on farms (large and small) and even in backyards. 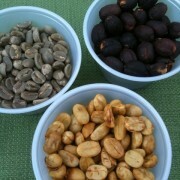 We are fortunate in Hawaii to have both cultivated and attracted major coffee talent and minds. One of them is Shawn Steiman, who is known as “the coffee scientist’ in these parts as he holds a PhD from University of Hawai‘i in the field of Tropical Plant and Soil Sciences and specializes in all aspects of coffee science – including horticulture, biochemistry, sensory analysis. If you are a coffee lover, you will find his book “The Hawaii Coffee Book: A Gourmet’s Guide from Kona to Kaua’i” fascinating. I turned to his book to learn more about Prepping & Drinking, as well as Selecting & Storing. FYI he also includes amazing coffee recipes in the book. – If you seriously love your coffee, choose a burr grinder instead of the blade grinder for your beans. You’ll get a smoother brew as a result of a more uniform particle size. When you buy coffee it is best to buy just enough to last 2-3 weeks, that way you get to enjoy fresh coffee at its best. Keep it in an airtight container and on a cool shelf or cupboard space. If you need to store for more than 3 weeks, best to keep it in an airtight container in the freezer and to be careful about how often you bring it out as changes in temperature and moisture from condensation will affect your beans.